The weather is South Carolina has been so strange. It’s been cold and rainy all weekend. Yuck! 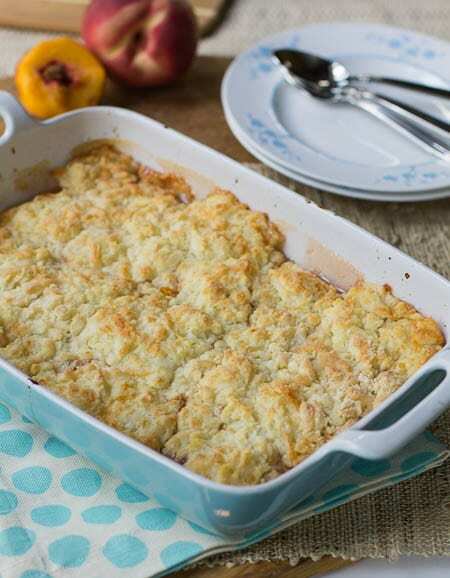 I feel so strange posting a Peach Cobbler recipe because the weather is so October-like. A Pumpkin Pie recipe would be more suitable. But this recipe is too good not to share. 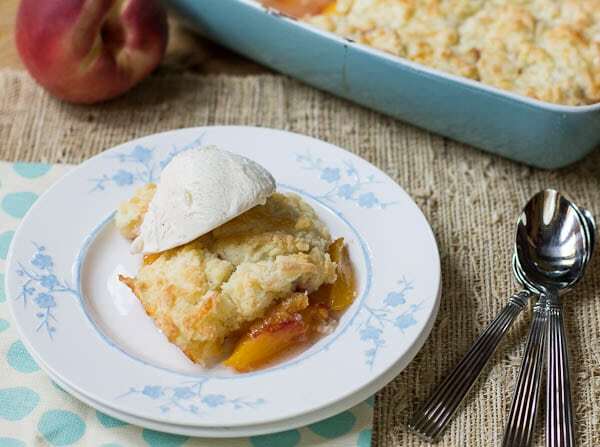 It has a sweet, juicy peach filling topped with a cheddar cheese biscuit-style topping. Yes, you read that right- cheddar cheese. In a cobbler. And not just a little cheese, but a full 2 cups. 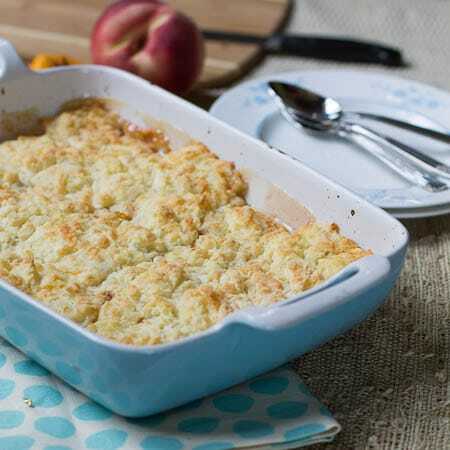 Now I’ve seen plenty of apple recipes that incorporate cheese, but this was the first peach recipe I had seen with cheese. It comes from the The New Southern Garden Cookbook: Enjoying the Best from Homegrown Gardens, Farmers’ Markets, Roadside Stands, and CSA Farm Boxes by Sheri Castle. If you like to cook using fresh seasonal ingredients, this is a great cookbook to have on hand. It contains more than 300 recipes organized alphabetically by type of fruit or vegetable. This was apparently Sheri’s grandmother’s cobbler recipe and she’s not sure what gave her grandmother the idea to combine cheese and peaches. She describes the cobbler as tasting like little fruit dumplings. The cobbler filling is super sweet (but I cut the amount of lemon juice in half) and thickens nicely due to the cornstarch. The sweet filling contrasts nicely with the biscuit topping which adds a slightly savory touch. The cheese really blends into the biscuit topping, and while you can taste it, it’s not at all overpowering. Plus it helps give the topping a wonderful golden brown coloring. Add a scoop (make it a large one 🙂 ) of vanilla ice cream for a delectable summer dessert, even if it feels like fall. P.S.- I’m giving in and looking through my fall baking recipes as I type. 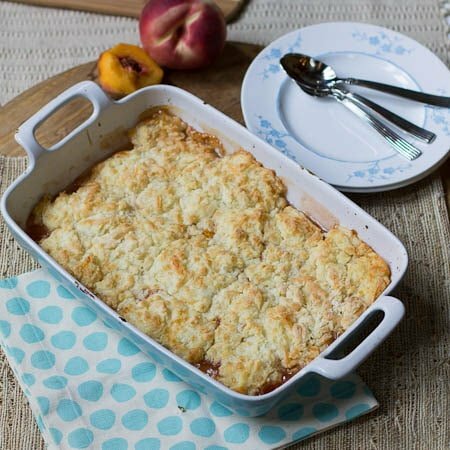 Peaches and white cheddar combine to make an unexpected but delicious peach cobbler. Preheat oven to 400º and butter a 9×13-inch baking dish. Spread peach slices evenly along bottom of baking dish. Combine sugar, cornstarch, salt, and cinnamon in a small bowl and mix well. Spoon sugar mixture evenly over peaches. Sprinkle lemon juice and almond extract on top. Stir to distribute. Scatter butter cubes over the top. Place in oven and bake for 15 minutes. While peach filling is baking, stir together flour and cheese in a large bowl. Combine melted butter and buttermilk in a small bowl and slowly pour into flour mixture, stirring gently with a fork. Mix just until a dough is formed. Remove baking dish from oven once it has baked for 15 minutes and stir gently to make sure sugar has dissolved. Drop dough by rounded tablespoons on top of filling. Return to oven and bake for about 20 minutes, until biscuit topping is golden brown and firm. 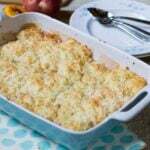 This entry was posted in Desserts, Pies and Tarts and tagged cobbler, desserts, peach cobbler, peaches, southern desserts, southern recipes. Bookmark the permalink. That’s such an interesting flavor combination. I bet it’s delicious! Yes, who would have ever thought cheese and peaches? I love the addition of cheese in the biscuits!! And I am with you…it’s been cold up in NY as well and I am refusing the urge to start fall baking. Thanks Zainab! And fall will be here soon enough won’t it? 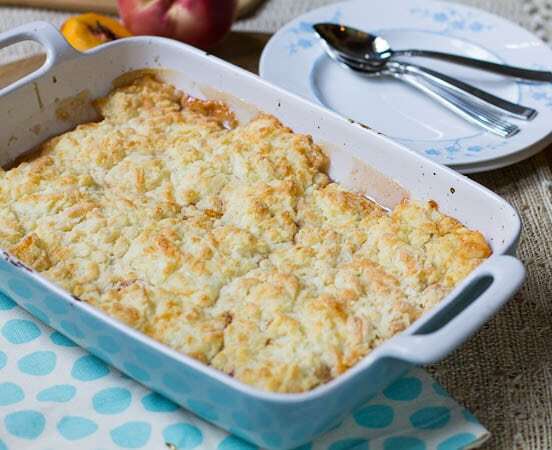 SO creative to add cheese to the topping for this cobbler. I’ve seen it done with apples before but not peaches, though it makes total sense. Thanks Laura! I wasn’t sure how it would turn out, but it’s really good! You’re welcome Consuelo! Hope you like it! Looks amazing Christin! I love the idea of using white cheddar cheese here with something sweet. Delicious! Thank you Anne! It’s funny how your tastes change as you get older. This is something I never would have eaten 15 years ago. Thanks Bam! A typhoon! Wow! Hopefully we will all have beautiful fall weather at least.